Sailing blog, sail the gulf coast, cuba, caribbean, rio dulce, venezuela, veracruz sailaway fun! : Port Isabel Texas Lighthouse South Padre Island view into past and present! Sailing blog, sail the gulf coast, cuba, caribbean, rio dulce, venezuela, veracruz sailaway fun! Join me on my Tayana 37 sailboat as I cruise the caribbean and gulf coast. following Knox Johnson and enjoy the liveaboard lifestyle! Learn from my hard sailing lessons and life experiences! La Vida Nueva is a 36 foot ocean going sailboat. She was built in Taiwan and is sloop rigged. Port Isabel Texas Lighthouse South Padre Island view into past and present! Navigating the South Padre waters is always a task. The inter coastal waterway is full of shifting dunes. From year to year one can never be sure where the real channel is. When the inter coastal waterway from Galveston opens up to the Laguna Madre and the Padre Island shores it looks like you finally have open water and safe cruising. I have been stuck with a dingy and an outboard between the intercoastal waterway and 2000 yards of bay water to Padre Island. Be careful! That is why they built the Port Isabel lighthouse. You can bet ships from yesteryear had as much trouble as modern day sailors and barge people do today. 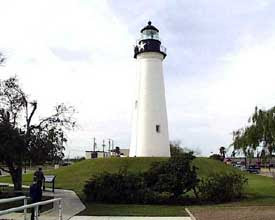 The Port Isabel Lighthouse was constructed in 1852, near sites of the Civil War Battle of Palmito Ranch in 1865 and the Mexican War Battles of Palo Alto and Resaca de la Palma. The light house system fell out of use over many years. New technology meant new towers with powerful navigation equipment. The depression kept public money out of the hands of the light house crews. Most of all, a new railroad line between Corpus Christi and Mexico made transportation by ship less economical. Sadly, in 1905, the Light House that guided so many mariners went dark. In 1947 visionaries sought to restore the light house and preserve Texas landmarks. The site was dedicated as a state park in 1952. Today, the historic landmark has become a popular tourist attraction. It took until the year 2000 to complete the restoration of the 72 foot structure. You can bet the delay was more for lack of funds than lack of interest. The lighthouse was returned to the appearance it had following its last major operational renovation in 1880. The restoration project involved extensive metal casting and fabrication, masonry and structural repairs, new coatings and development of the park and surrounding grounds. The Port Isabel Chamber of Commerce occupies the old light keeper’s cottage. Perhaps it was a cottage then. It would make a fabulous home today! They have an exhibit of the lighthouse and old fort Polk that was on the site. Most important during tourist season, there are clean bathrooms. If you love touring light houses this is the one to see. In fact it is the only one to see on the Texas coast. The rest are closed to the public. Surely, sage minds have an answer to the question, why aren’t more open? The lighthouse is on high ground if you consider 50 feet above sea level high ground. The perch gives photographers and tourists a wonderful view of the Island, the Laguna Madre, the Padre beach and the surrounding area. It has even been used as a wedding chapel. That is for the young, access to the top is up 75 winding stairs including three short ladders. There is a small fee to enter the lighthouse but it is well worth the investment! It is easy to pass through Port Isabel without stopping as you rush over the causeway on your way to Padre. However, if you want to experience the flavor of life in an old sea port, the city of Port Isabel should be on your list! Publish your saling story! E-Junkie! Why not write your own e-book about your adventure travels or some aspect of sailing? Maybe you have a touring idea, cruising guide or some special organizational ideas? Spend a few hours writing your e-book or e-manual, contact the e-junkie people, and let others help market your book on line! Just hit this button to get started, no charge! amazon has some great deals, check this out! ENGLISH TEACHING SYSTEM Perfect for kids and adults! Check these out, well worth a look! Rescue children at risk! Wow! Most spectacular Tayana 37 on market - Pristine, equipped! Follow along, subscribe for Free!